Koinex — Indian Crypto Exchange, offers multiple cryptocurrencies trading which includes Ethereum, Bitcoin, Ripple, Litecoin, Bitcoin Cash. If you are new to Cryptocurrency, refer our blog on - What is Cryptocurrency? The ultimate guide for beginners. Koinex is popular among people because of its user-friendly and intuitive interface. Koinex plans to provide support for inter-cryptocurrency trades and other new cryptocurrencies. Koinex has shown highest concern towards security by including 2-Factor Authentication (2FA) using Google Authenticator App. After knowing the importance of Koinex, I am sure you will be curious to start trading in cryptocurrency using Koinex. So, let’s not beat about the bush and learn step-by-step on how to buy/sell cryptocurrency from Koinex in India. How to create an account for Koinex Wallet? 1. Sign up using this reference link - so that you can earn Rs. 50. On visiting this link, you will be landed at Koinex’s website as shown above. Click on “Send OTP” to receive One Time Password on your mobile. 2. Enter the OTP in the box and Click “SUBMIT”. 3. After that, you will be displayed below mentioned page. Here you will have to complete 4 steps one after another. 4. Let’s move to Step 1. Verify your email address. 5.1. Click “ACTIVATE” and you will see this screen. 5.2. Click “ENABLE” to enable google authenticator. 5.3. Download & Install Google authenticator app on your mobile. 5.4. Scan the QR code on left with the Google Authenticator app from mobile. 5.5. Enter the OTP generate automatically by Google Authenticator and click “ENABLE”. Great, now, you have enabled Google Authenticator. *After 30 secs, new OTP is generated every time by Google Authenticator app. 7.1 Upload PAN Card, Aadhar Card and Photograph under KYC documents. All documents should be in JPG or PNG format only. The maximum file size permissible is 3.5MB. 7.2. Scroll down and fill in your KYC details and bank details & Click “Save” respectively. 7.3. Click “PROCEED” on right top corner. 7.4. Verify once again properly all your details and then click “SUBMIT”. Now your Account status will switch from “PENDING” to “UPLOADED”. *Your KYC Application will be verified within 48 hours after submission. How to deposit money to Koinex Wallet? 2. Click “BALANCES” in the menu bar. 3. Scroll down to INR wallet and note down Bank details and Unique Account Number where you need to deposit money. 4. Now Login to your mobile banking / net banking service. 5. Transfer the desired amount by entering Koinex’s account number and other required details. 6. Hurray! You have successfully transferred the funds to Koinex and the same will be reflected in your account within 4-5 hours. Once the money is deposited, you can check the available amount under the ‘Balance‘ tab. Note: You can also deposit your money to Koinex wallet using Payment Gateway, but they charge 2% fees. How to buy/sell cryptocurrency from Koinex? 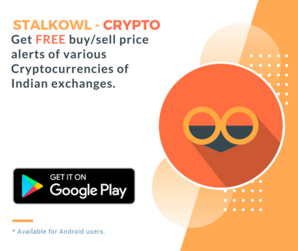 After depositing money to Koinex Wallet, you can easily buy/sell cryptocurrency. Here, I will show you how to buy/sell Bitcoin. 1. Login to your Koinex account. 2. Hover over “ETHEREUM” and select “BITCOIN”. 3. To start trading in different cryptocurrencies, go to the top-right panel - “TRADE” as shown below below. 4. Enter the BTC volume that you want to buy in the left box and the rate at which you want to buy in the right box. Click “BUY”. 6. Your buy order will be displayed under “BALANCES” if the current rate matches with your ask rate. If it doesn’t matches, then it will be displayed under “OPEN ORDERS”. Here you can see that I have purchased BTC at Rs. 1100000 but the current rate being 1204500, the buy order is displayed under “OPEN ORDERS”. Similarly, you can buy/sell other Cryptocurrencies from Koinex. So share your feedback on Koinex with us in the comments below. Don’t forget to like and share this post with your friends. Trading in bitcoins and cryptocurrencies is subject to market, technical and legal risks. Prices in India vary from international prices due to local demand and supply. Koinex does not guarantee any returns. Users use Koinex at their own risk. Also the provided information is completely based on personal experience and it doesn't influence or promote an individual to trade in various cryptocurrencies.